On Being Well-Coordinated: A Half-Century of Research on Transition Metal Complexes: Selected Papers of Fred Basolo. Fred Basolo and John L. Burmeister, Editors; World Scientific Publishing Co.: Singapore; River Edge, NJ, 2003; http://www.worldscientific.com. Figures, tables, photograph. xii + 640 pp. 19.6 ´ 26.8 cm. $101.00; £75. ISBN 981-238-087-6. Fred Basolo, who died on February 27, 2007 , cited three reasons for editing this book, which is Volume 13 in the World Scientific Series in 20th Century Chemistry (ISSN: 1793-138X), the Consulting Editors of which were the late Derek H. R. Barton and the late F. Albert Cotton, and are presently Y. T. Lee and Ahmed H. Zewail. Fred had just finished writing his autobiography, From Coello to Inorganic Chemistry , he was able to convince his former doctoral student, John L. Burmeister, Alumni Distinguished Professor and Associate Chairman of the University of Delaware’s Department of Chemistry and Biochemistry, to help him as coeditor, and he hoped that the book under review here “may be useful to historians wanting to write about the history of chemistry research in the 20th century, specifically, that involving inorganic chemistry” (p ix). Because the series “aims to provide a historical perspective on the development and progress of the varied fields now to be found in Chemistry….by collecting together all the major papers published by great chemists of this century, in volumes often edited and with commentary by the featured chemist himself/herself,” Basolo and Burmeister’s volume fits ideally into the series. The editors present the highlights of the five decades of research when Basolo served as a world leader in the modern renaissance of inorganic chemistry  and attracted doctoral students and postdocs from all over the world to his laboratory at Northwestern University. Extensive introductions to the three parts of the volume indicate what students were involved, what prompted the research projects, and what were their major accomplishments in much the same informal but fact-filled way that Basolo adopted in his autobiography . Although the work was of the “pure,” academic, curiosity-driven type, some aspects have proven to be useful in applied projects. The seven-part eight-page Appendix contains lists of (1) 13 review articles published between 1953 and 1994, (2) 58 students with years of their doctorates,* (3) 66 postdoctoral fellows with years of participation,* (4) 53 other coauthors,* (5) Basolo résumé,* (6) Burmeister résumé, and (7) Basolo Medalists from 1991 to 2003 (Items with asterisks have also appeared in Basolo’s autobiography ). While I take personal pride in my scientific legacy, it could not have been realized without the love and support of family, as well as the hard work and dedication of my many students, post-docs, and collaborators. I have indeed, been richly blessed (p ix). This valuable collection of articles with his detailed commentary forms an excellent complement to Basolo’s previously published autobiography . Owners of From Coello to Inorganic Chemistry as well as inorganic chemists, coordination chemists, and historians of chemistry, especially those concerned with 20th-century science, will want to purchase this first-hand record of important discoveries that will be useful to current and future generations of chemists. 1. Kauffman, G. B.; Kauffman, L. M.; Gray, H. B. Fred Basolo (1920–2007): Dean of American Coordination Chemists. Chem. Educator, in press. 2. Basolo, F. From Coello to Inorganic Chemistry: A Lifetime of Reactions; Profiles in Inorganic Chemistry, John P. Fackler, Jr., Series Editor; Kluwer Academic/Plenum Publishers: New York, Boston, Dordrecht, London, Moscow, 2002. For a review see Kauffman, G. B.; Kauffman, L. M. Chem. Educator 2003, 8, 279–285; DOI 10.1333/s00897030707a. In On Being Well-Coordinated Basolo remarked that he enjoyed writing his autobiography “because of the memories it brought back to me. Likewise, at age 83 and handicapped, I need something to keep me busy each day” (p ix). 3. Nyholm, R. S. The Renaissance of Inorganic Chemistry. J. Chem. Educ. 1957, 34, 166–169. 4. Burmeister, J. L.; Basolo, F. Inorganic Linkage Isomerism of the Thiocyanate Ion. Inorg. Chem. 1964, 3, 1587–1593 (reprinted on pp 154–160 of the present volume). 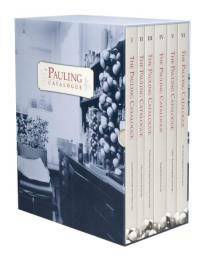 The Pauling Catalogue. Ava Helen and Linus Pauling Papers at Oregon State University. Chris Petersen and Cliff Mead, Editors. Valley Library Special Collections, Oregon State University: Corvallis, OR 97331-4501, 2006. Six paperbound volumes in elegant slipcase. Illustrated. xcviii + 1669 pp. 21.0 ´ 26.7 cm. ; $125.00 + $15.00 shipping and handling in the continental United States; Orders from Alaska, Hawaii, and international orders are accepted by email (order@paulingcatalogue.org), telephone ((541) 737-2075), or mail (Pauling Catalogue Orders, Special Collections, 121 The Valley Library, Oregon State University, Corvallis, OR 97331); http://paulingcatalogue.org. ISBN 0-9629082-3-1. Linus Carl Pauling was born in Portland, Oregon on February 28, 1901, the first of three children of pharmacist Herman W. Pauling and Lucy Isabelle Pauling (née Darling) [1–5]. An internationally acclaimed scientist, educator, humanitarian, and political activist, the only person to have received two unshared Nobel Prizes (chemistry, 1954 ; peace, 1962 [7–9]), he was characterized by New Scientist magazine as one of “the twenty greatest scientists of all time, on a par with Newton, Darwin, and Einstein.” His magnum opus, The Nature of the Chemical Bond , is one of the most influential and frequently cited scientific books of the 20th century. His advocacy of megadoses of vitamin C for the common cold, cancer, and AIDS is the still controversial work for which he is best known to the general public . His life and career were characterized by controversy, and almost everything about him was larger than life. Pauling majored in chemical engineering at Oregon Agricultural College (now Oregon State University), where he developed the belief that guided his lifetime of research—atomic arrangements must be responsible for the chemical and physical properties of material substances. He received his B.S. degree in 1922 and entered the California Institute of Technology at Pasadena, where he worked with Roscoe G. Dickinson and adopted the relatively new technique of X-ray crystallography to explore the structure of crystals. In 1925 Pauling received his Ph.D. and was awarded a Guggenheim fellowship to pursue postgraduate research in Europe with Arnold Sommerfeld, Niels Bohr, and Erwin Schrödinger. The first to realize the implications of the new quantum mechanics for chemistry, he applied this field of physics to explain and predict the properties of atoms and ions and thus to revolutionize chemistry. In 1927 Pauling returned to Pasadena to join the faculty of Caltech, an association destined to last until 1963, when he resigned. Here he used X-ray diffraction to measure the distances and angles of atomic bonds in three-dimensional structures—first, of inorganic crystals and later, of organic compounds. One of the key concepts of Pauling’s quantum theory of chemical bonding was resonance, an idea that he introduced in 1931: Some ions and molecules cannot be represented by one classical structure but require what he called a “hybridization” of two or more so-called canonical structures. In less than a decade he had transformed the earlier, somewhat simplistic theory of the chemical bond into a powerful, highly sophisticated theory and research tool. In the mid-1930s Pauling turned his attention to molecules present in living things. His interest in how oxygen is bonded to the hemoglobin protein molecule that carries oxygen via the bloodstream to cells throughout the body led to his more general interest in proteins, the nitrogen-containing organic compounds required for all the life processes in animal metabolism. In 1948, while in bed with influenza, Pauling occupied himself with making a paper model of linked amino acids, the basic building blocks of proteins. He thus discovered the a-helix—a crucial concept that led James Watson and Francis Crick to make one of the crucial discoveries of the century—the helical structure of DNA, the physical basis of heredity. This led to the human genome project and the current revolution in genetic engineering. Had Pauling made the discovery, he, not Watson and Crick, would undoubtedly have won the Nobel Prize in Physiology or Medicine—his third, and unprecedented Nobel. After World War II Pauling theorized that sickle cell anemia was the result of a genetic defect in the cell’s hemoglobin molecules, and in 1949 he and Harvey Itano confirmed this idea and identified what they called a “molecular disease”—one that could be explained by a molecular abnormality. In 1954 Pauling received the Nobel Prize in chemistry “for his research on the chemical bond and its application to the elucidation of the structure of complex substances” . Less well known to laypersons as well as many scientists is Pauling's evolution, encouraged by his wife, Ava Helen, from an ivory tower scientist to an ardent and articulate public spokesman on technological issues and the social responsibility of scientists. His battles with political and ideological enemies, including the U. S. government, which denied him research grants and a passport, although eventually resulting in his ultimate vindication, consumed much of his time and energy. His 1962 Nobel Peace Prize  was denigrated by many, and the American Chemical Society, which he had served as president in 1949, snubbed him. In 1963 Pauling left Caltech to become research professor at the Center for the Study of Democratic Institutions at Santa Barbara, California, where he divided his time between the fields of chemistry and world peace. Here he became greatly interested in what he called “orthomolecular medicine”—a biochemical approach to human health, with the central idea that large amounts of particular nutrients normally present in the body can be used to treat or prevent disease. In 1973, following professorships at the University of California, San Diego (1967–1969) and Stanford University (1969–1974), he founded and became president of the Linus Pauling Institute of Science and Medicine, an organization of which he was director of research at the time of his death. He died of cancer at his Deer Flat Ranch near Big Sur, California on August 19, 1994 at the age of 93. Pauling has been called one of the two greatest scientists of the 20th century (the other being Einstein) and the greatest chemist since Antoine-Laurent Lavoisier, the 18th-century founder of modern chemistry. His multifaceted life and activities, both scientific and personal, spanned almost the entire 20th century. In 1986 Pauling donated both his and his wife’s papers to Oregon State University, their alma mater. At more than 500,000 items, these papers rank among the largest personal archives in the world. Two decades later, in what is a 20-year labor of love, the OSU Libraries Special Collections has published the complete inventory of this remarkable collection. It contains the most detailed inventory of one of the world’s largest archival collections; introductions to each of its six volumes by major authors, historians of science, or members of the Pauling family; more than 1,200 illustrations, 120 in full color, with extensive captions relating the stories behind the images; a beautifully illustrated 45-page timeline chronicling the details of the lives of Linus and Ava Helen Pauling’s lives; and an extensive reproduction of Linus Pauling’s 1917 diary. Each volume has separate pagination and separate ISBNs. Dedication—by William H. and Michal S. Rieckmann (The Rieckmann Family Foundation supported the publication of The Pauling Catalogue) (1 page). Preface—by Chris Petersen and Cliff Mead, both of Special Collections, Oregon State University Libraries (3 pp). Foreword—by Chris Petersen; summarizes the contents of the catalogue) (6 pp). Introduction to Volume I—by Mary Jo Nye, Department of History, Oregon State University (2 pp). Timeline—by Robert J. Paradowski, Rochester Institute of Technology (44 pp). Correspondence; letters received by Linus Pauling as well as carbon copies of letters sent by Pauling, arranged alphabetically and sub-sorted chronologically (57 pp). Publications; chronologically arranged original reprints of Pauling’s more than a thousand publications (48 pp). Manuscripts and Typescripts of Articles; many unpublished articles and correspondence relevant to their development and publication; in many instances abstracts, galley proofs, figures, research notes, and other background materials are included (130 pp). Introduction to Volume II—by Robert Olby, Department of History and Philosophy of Science, University of Pittsburgh (3 pp). Science; divided into 15 thematic sub-sections, which reflect the extraordinary breadth of Pauling’s scientific biography (66 pp). Research Notebooks; 47 original research notebooks from 1919 to 1994, including many of his laboratory calculations, experimental data, scientific conclusions, ideas for further research, and biographical musings (80 pp). Appendix: 1917 Diary; kept by young Linus from August, 1917 through the first several months of his freshman year at Oregon Agricultural College (18 pp). Introduction to Volume III—by Thomas Hager, Director of Communications, University of Oregon, and the author of several books on Pauling [12–14] (4 pp). Peace; 8 thematic sub-sections illustrating Pauling’s manifold interests in peace and humanism; manuscripts, typescripts, correspondence, notes, meeting minutes, non-Pauling publications and other ephemera reflecting the numerous concerns addressed by the Paulings and the international peace movement from the mid-1940s to the mid-1990s; a bound three-volume Bomb Test Petition to the United Nations, for which Pauling received the 1963 Nobel Peace Prize  (180 pp). Ava Helen Pauling; manuscripts and typescript leaves, correspondence, assorted biographical materials, publications, and government documents; writings on issues of peace, civil liberties, and women’s rights; correspondence and meeting minutes chronicling the Women’s International League for Peace and Freedom, Women International Strike for Peace, and Federal Union (32 pp). Travel; In the course of the Paulings’ 58-year marriage they visited every continent except Antarctica; itineraries, transit and hotel receipts, maps, and assorted background materials; even Linus’ trip to attend my “Coordination Chemistry Centennial Symposium” at Denver, CO, March 28-April 2, 1993 is listed (p 226) (14 pp). Honors, Awards, Citations, Diplomas and Other Recognitions; includes the nearly 50 honorary doctorates, two Nobel medals, Lenin Peace Prize medal, M. V. Lomonosov medal, and National Medal of Science; also correspondence and related background materials (20 pp). Introduction to Volume IV—by Robert J. Paradowski (4 pp). Biographical; an eclectic array of manuscript and typescript materials; correspondence; notebooks; newspaper clippings; government, legal, and tax documents; and receipts sorted into sub-sections labeled Academia; Political Issues; Legal, Business, & Financial; and Personal Materials & Family Correspondence; also more than 2,700 pages of loose-leaf scrapbooks (254 pp). Personal Safe; Drawer 1: more than 700 letters, mostly love letters, between Linus and Ava Helen; Drawers 2 and 3: communications with world-historical figures; Drawer 4: dozens of notebooks and scores of Dictaphone belts, including chapters of a proposed autobiography (104 pp). Introduction to Volume V—by Barclay Kamb (the Paulings’ son-in-law), Linus Pauling, Jr., and Linda Pauling Kamb (5 pp). Audio/Visual; audiocassette tapes; vinyl records; videotapes; Dictaphone belts; and audio tape and film reels of commencement lectures, public speeches, radio appearances, and taped interviews (32 pp). Photographs and Images; This, the most frequently consulted of all the Pauling Papers includes more than 5,500 photographs, drawings, and other images of Pauling, his family, and colleagues; three photographs of Pauling with me at my “Coordination Chemistry Centennial Symposium” at Denver, CO, March 28–April 2, 1993 are listed (pp 273–274) (248 pp). Introduction to Volume VI—by Cliff Mead, author of a book on Pauling  (4 pp). Newspaper Clippings, Magazine and Journal Articles; more than 3,000 items, both domestic and foreign, either focusing on or mentioning Pauling, who, along with Albert Einstein and J. Robert Oppenheimer, was one of the most recognizable scientists of the twentieth century (134 pp). Personal Library; more than 4,000 volumes from the personal library of the Paulings, ranging from pure science to sociological surveys to detective stories to crossword puzzles, annotated and arranged alphabetically according to the author’s last name (179 pp). The Pauling Catalogue, printed in an edition of 1,000 copies on acid-free 86 pound Gold East Matte, with its richly illustrated listings of Linus and Ava Helen Pauling’s extensive correspondence, manuscripts, research notebooks, and awards, as well as their scientific, peace, and personal papers is a fittingly ambitious tribute to the remarkable lives of this couple. It forms a perfect complement to the selected collection of Pauling’s scientific papers . It constitutes an invaluable resource for historians of science and chemistry, scholars of science policy, and advocates of the peace movement, along with practicing chemists and scientists interested in the history of their fields, especially during the 20th century. It belongs in every academic library. Furthermore, its incredibly modest price, considering the magnitude of its contents and the number of its illustrations, makes it a “best buy” for students as well. 1. Kauffman, G. B. Linus Pauling: American Chemist 1901–1994. In Chemistry: Foundations and Applications; Lagowski, J. J., Ed. in Chief; Macmillan Reference USA, An Imprint of the Gale Group, A Division of Thomson Learning, Inc.: New York, NY, 2004; Volume 3; pp 223–225. 2. Kauffman, G. B.; Kauffman, L. M. An Interview with Linus Pauling. J. Chem. Educ. 1996, 73, 29–31. 3. Serafini, A. Linus Pauling: A Man and His Science; Paragon House: New York, NY, 1989. 4. Newton, D. E. Linus Pauling: Scientist and Advocate; Facts on File: New York, NY, 1994. 5. Goertzel, T.; Goertzel, B. Linus Pauling: A Life in Science and Politics;Basic Books: New York, NY, 1995. 6. Pauling, L. Modern Structural Chemistry. In Nobel Foundation. Nobel Lectures Including Presentation Speeches and Laureates’ Biographies; Chemistry 1942–1962; Elsevier Publishing Co.: Amsterdam-London-New York, 1964; pp 425–437; http://www.nobel.se/chemistry/laureates/1954/pauling-lecture.html (accessed July 2007). 7. Pauling, L. No More War! ; Dodd, Mead & Co.: New York, NY, 1958, 1984. 8. Pauling, L. Science and Peace. http://www.nobel.se/peace/laureates/1962/pauling-lecture.html (accessed July 2007). 9. Marinacci, B.; Krishnamurthy, R., Eds. Linus Pauling on Peace: A Scientist Speaks Out on Humanism and World Survival; Rising Sun Press: Los Altos, CA, 1998. 10. Pauling, L. The Nature of the Chemical Bond; Cornell University Press: Ithaca, NY, 1939, 1940, and 1960. Pauling later prepared an abridged version intended especially for students: The Chemical Bond: A Brief Introduction to Modern Structural Chemistry; Cornell University Press: Ithaca, NY, 1967. 11. Pauling, L. Vitamin C and the Common Cold; W. H. Freeman: San Francisco, CA, 1970. 12. Hager, T. Force of Nature: The Life of Linus Pauling; Simon & Schuster: New York, NY, 1995. 13. Hager, T. Linus Pauling and the Chemistry of Life; Oxford University Press: New York, NY; Oxford, 1998. 14. Mead, C.; Hager, T. Linus Pauling: Scientist and Peacemaker; Oregon State University Press: Corvallis, OR, 2000. 15. Kamb, B.; Kamb, L. P.; Pauling, P. J.; Kamb, A.; Pauling, Jr., L., Eds. Linus Pauling: Selected Scientific Papers; 2 vols. ; World Scientific Publishing Co.: Singapore; River Edge, NJ, 2001.